Plyometrics boxes are an excellent way for conditioned athletes to increase and develop their jumping, sprinting and explosive power. These Plyometric Platforms are versatile and can meet the needs of every athlete, no matter what their level of competition. Ultimate combination of durability, stability, and safety, with an extra-large landing surface of 30" x 36", athletes' fears of missing the box are eliminated. These plyo boxes are made with a 100% foam core that will not break down, delaminate, or soften over time, and covered with an easy to clean durable vinyl surface. The handles on the boxes allow for quick repositioning. Each box has eight 2" x 4.5" strips of velcro along both the top and bottom surfaces to enable stacking and prevent the boxes from slipping apart during use. 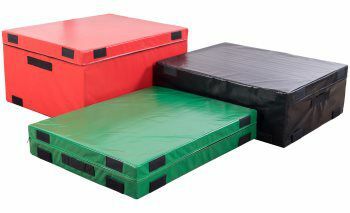 These bright, colourful, durable and impact absorbing plyo boxes will provide a unique addition to your gym. 30" x 36" x 6"
30" x 36" x 12"